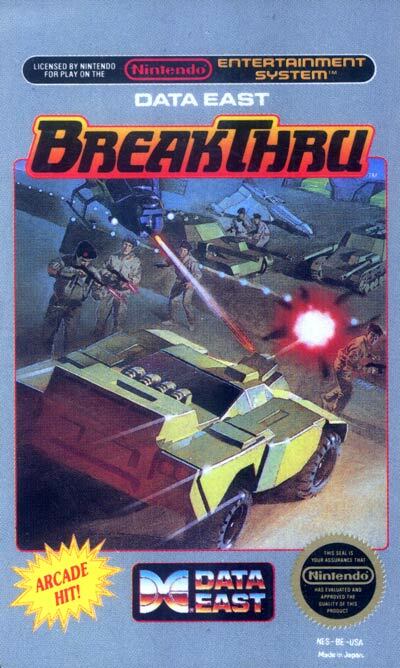 The goal is to drive a dune buggy to "BreakThru" the enemy lines of five different areas. The five areas are "Mountain", "Bridge", "Prairie" (Although early advertising labeled it "Jungle"), "City", and "Airfield". Secret fighter plane PK430 has been stolen from your country, and it is up to you to get it back. You will drive a buggy equipped with a gun and "BreakThru" five different enemy strongholds. On your way you will encounter obstacles such as land mines, rocks, soldiers, jeeps, flamethrowers, tanks, trucks, armored vehicles, and helicopters.